As you learned from the previous article, we were recently on a Hawaiian Adventure with our RokPak Pioneer Series. The team here at RokPak loves to go outdoors, explore and participate in all that a place has to offer. Let the stories continue of our adventures and how the RokPak played a crucial role in those Hawaiian Adventures. This adventure started with us arriving to the marina at dusk, so our ride out to the secret spot was a beautiful one with the sun setting over the horizon. The sky quickly became dark and we arrived at the cove where there were several other boats (ok not so secret). Some people decided to snorkel while others put on their dive gear. The water at this spot is only about 20-30 feet depending on the spot, but the whole area is swimming with Manta Rays. Seeing these creatures up close and personal is truly a breathtaking experience. They come within an inch of you and can be up to 23 feet wide! Manta Rays are filter feeders, so there is no concern for them to attack you. In fact, everyone had lights and even surfboards with lights on the bottom. 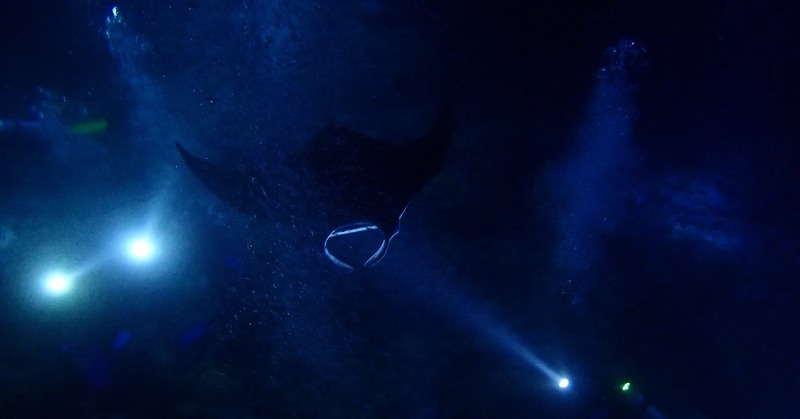 The light attracts the zooplankton creating a feast for the Manta Rays. Now, on the ride out we were prepared this time. Phones and underwater cameras fully charged to catch every moment of this experience. The RokPak was coming on this voyage as a backup power source and watertight location for keys and wallets. This was a group excursion and we overheard some others saying they forgot to charge their camera and were disappointed almost to the point of tears. This being a once in a lifetime experience, we couldn’t stand by. RokPak to the rescue! We showed the couple the RokPak and told them what it could do. After they got out their charging cable and plugged in, their waterproof camera was charging. In fact, it was almost fully recharged by the time we got to the cove where we saw the amazing creatures. After the excursion was over they thanked us about 100 times, but it was not necessary. They even shared some of the amazing photos of the Manta Rays with us. The picture of the Manta Rays at the beginning of this article would not have been possible without the RokPak. Even with giving them the RokPak to charge their waterproof camera we still had plenty of battery left to get us through the rest of our night. Our company is all about promoting goodwill and helping others where we can. If there is an opportunity to do so, we will. So when you decide to get your RokPak you become part of our family. We truly care about our customers and want to make every experience they have the best it can be. There are a few more stories about this particular adventure coming soon, so make sure to subscribe to our blog posts so you can hear about how the RokPak Pioneer Series really helped us out while checking out the volcanoes on our Hawaiian adventure. Aloha until the next post. Keep on exploring and enjoying the outdoors! COOL THING TO DO… I GUESS A ROKPAK TO KEEP YOUR STUFF SAFE…WHILE YOU’RE DOWN BELOW. Great to protect against water damage! That was a wonderful thing to do! Okay you’ve convinced me. RokPak may well be your most important piece of survival gear. Waterproof cameras, yet my phone dies if I sneeze near it. In many countries phones are required to be water resistant, like cheap watches. That looks like fun. I’ve seen manta rays before, but not this up close. It looks like a heavy duty powerpack is really called for here. Cheers to RokPak and a water proof power pack. Rokpak to the rescue! It was nice that you were able to share your Rokpak with the other people on your incredible trip. I bet they will be customers and will tell their friends. The RokPak Pioneer Series is truly a go anywhere solar charger. Good to have I.C.E. gear. ” Unbearable”. Soaked hand in hot water to distribute and thin out poison, felt better about 45 minutes later. JUST A BEAUTIFUL THING TO SEE. As a Scuba Diver I have been around Rays in Monterey Cal. BUT never dived in such clear warm water as around Hawaii. Someday maybe I will be able to visit. I am a PADI Open Water Scuba Instructor. Having a great drybox/charger would be a real asset. I already have USB battery chargers that I could hook up to a RokPak Pioneer. This would allow me to always have fully charged batteries for my dive lights. What a great advantage. Always good to have I.C.E. Very flexible in its usages. I like that. Imaginative, Innovative and Ingenious. Get RokPak and Rok your outdoor world. I.C.E. it’s nice to have. A useful tool for good times and bed…hopefully the good times out number the bad. I WONDER IF THERE IS A SIMILAR PLACE TO SEE MANTA’S IN THE CARRIBEAN?.. This is amazing. My husband got to swim with the rays in Mexico. I have thought about this, and YES I hope I can grab the RokPak I hope to win here, head tl Hawaii and go do this. When it’s an emergency, it’s good to have. With the cost of solar panels getting so low, items like this will become part of your basic kit. The coolest solar charger available. Get a RokPak. This would also be good to put a battery charging device loaded with AA or AAA batteries in the compartment and charge them as you walk. Sadly not all devices have built in chargeable batteries. I know my small LED flashlight would work well with this. Same blog post since April 26th… what can I say that I haven’t said? Good to have I.C.E. Revolutionary RokPak chargers are outstanding outdoors. Great solar charger and dry box. A good item for this device would be rubber stoppers on the USB holes in the device. This would keep any grit or other detritus from getting in them from a dirty GPS device or radio for example. Like the ones often found covering the holes on phones. When I win this, see what I did there, I will put it to good use as I almost always have one or two electronic devices going at the same time. Rok my day, Rok my night, I know with RokPak It’ll be alright. I got the power. I love all of the different uses your product line has. It really makes you think outside the box as to what is possible. I think the best selling point is the case. Dropping something electronic should not be a main worry. The RokPak Pioneer Series is THE outdoor solar power solution. My wife wants one simply because of the case it is mounted in. Thanks for the chance to win such a nice item. When I was younger solar power items were ether cheaply made or overly prices. Now you have a good combination here. My wife and I swam with rays on a cruise a few years ago. Unique experience for sure. Go anywhere, anytime with confidence knowing that you will always have power for your electronics. I do hope the lights are replaceable and not a sealed unit. Steve Irwin got stung by a stingray,,, better have RokPaq I.C.E. The more I have thought about this, the more I want to do it! RokPak is the one and only solution that you’ll ever need for outdoor power. I’m more surprised there are not more kits like this out there. The small folders seem nice, but have never seemed rugged to me. Rokpak is a great, go anywhere, portable, waterproof, rugged, solar charger for all outdoor environments. I hear that some solar panels lose capacities over time. Is that a worry? RokPak Pioneer series is THE portable power solution. This is the gadget I want with me on my dive trips. This would be amazing to do.